This fall, we're making something new and exciting. Spritzy + lower in alcohol. So we looked to our friends and to history for inspiration. The results are even more delicious than we could have imagined.... So what is this magical nectar? Well, it's an all-but-forgotten beverage called PIQUETTE. Piquette is a vinous beverage produced by hydrating pressed grapes with water for a second fermentation. Because freshly pressed grapes are chock-full of sugar and yeast, a second spontaneous fermentation takes off when water is added to the grapes. This yields a refreshing, wine-like beverage with a lower alcohol percentage than traditional wine. Historically piquette was a popular beverage among field workers throughout Europe who would've likely been given pressed grapes as payment for their labor in the vineyards. Because the workers were often unable to afford the expensive wines that their labor produced, they excitedly turned their pomace payment into a thirst-quenching wine-like spritzer for consumption at the end of long day working in the vineyard. During the Great French Wine Blight in the late 19th century, the production of wine fell so dramatically in France that piquette production soared to make the most of increasingly scarce grapes. Getting two uses out of the grapes that so much hard work went into growing in the vineyard makes perfect sense. The first use yields a complex, site-specific wine that tells a story of a particular time and place. The second use yields a refreshing piquette. Just like many centuries ago, it's the perfect beverage to enjoy at the end of long day working around the house, mowing the lawn, tending the garden, or splitting firewood. Piquette is not only thirst-quenching and gulpable, it's also a natural byproduct of sustainable winemaking program and has a taste, story, and experience all of its own. It's not designed to replace that special bottle of wine shared at the kitchen table. It's meant to quench your thirst and leave you refreshed after a few glasses. Here at Old Westminster Winery, we think that piquette is worth exploring. During harvest, we have TONS of grape pomace with little purpose but to be composted. Such a shame! It's with a resourceful and creative spirit that we decided to try our hand at making fresh, alluring, and artful piquette. We collected and hydrated all of our grape skins in tanks to macerate and ferment spontaneously with wild yeast. This stuff is too good -- and too valuable -- to waste! After a few days, we drained the tank, pressed the skins and sent the juice to a mix of stainless steel, oak barrels and our foeder. When the fermentation is nearly finished – and the remaining sugar is at the precise level – we bottled the wine under crown cap. The fermentation finishes in bottle and the resultant CO2 is trapped and dissolved into the wine under pressure to create beautiful, fine bubbles. This method is called pét-nat. Pét-nat is a natural style of sparkling wine that made its debut in France’s Loire Valley half a millennia ago. Pétillant naturel (lit. “naturally sparkling”) is fresh and fizzy while displaying authentic handmade qualities. If you've been following us at all over the years, you know we're all in on pét-nat. We absolutely love her raw, unpolished vitality. 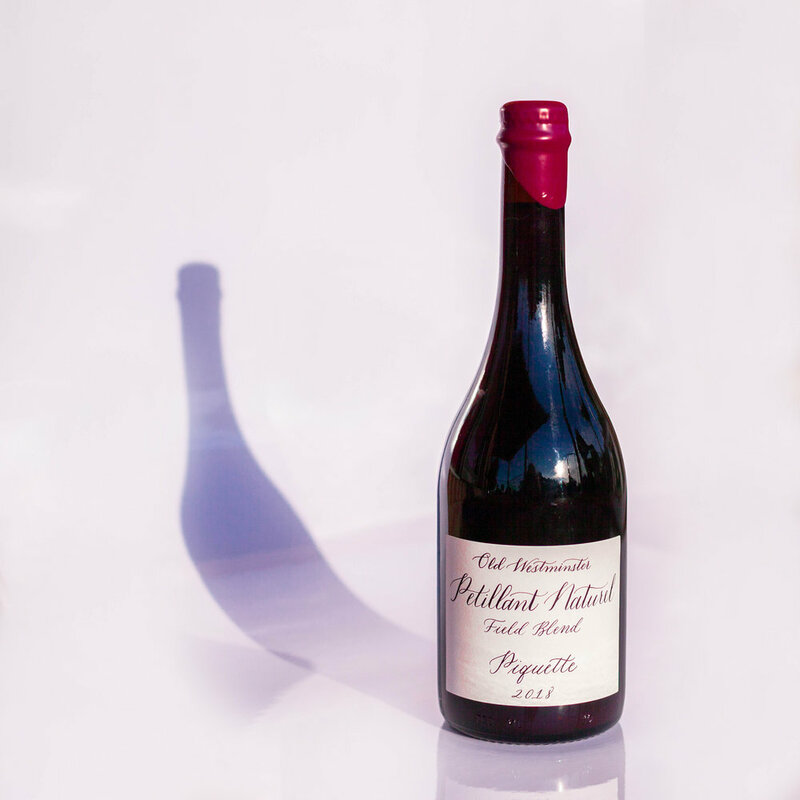 We think the pét-nat method is the perfect way to flaunt the lively, youthful character of piquette. We'll be releasing the first pét-nat piquette to our wine club members on the first of November. Not a part of our Wine Club? Click here to join so that you can get first dibs on this limited edition beverage!